Non-allergic rhinitis is an extremely frustrating sino-nasal disorder that is characterized by all the same symptoms of sinusitis and allergies, but NOT due to sinusitis or allergies. Rather, I consider non-allergic rhinitis to be the over-sensitive nose syndrome whereby breathing in air containing particulates (whether smoke, perfume, dust, pollen, etc) PHYSICALLY irritates the nose causing symptoms. This is in contrast to allergies where the pollen causes an immunologic reaction causing symptoms or sinusitis which is due to an infection. Non-allergic rhinitis is diagnosed by a negative allergy test (meaning symptoms are not due to allergies) and normal CT sinus scan (meaning symptoms are not due to a sinus infection). Usually, treatment encompasses avoiding triggers (ie, perfume, smoke, dust, etc), applying a barrier nasal emollient (ie, ponaris, anti-histamine nasal spray (ie, astelin, astepro, patanase), and nasal hygiene using saline flushes which washes away the irritants causing symptoms. Well, a new study published this month have shown another mode of treatment is quite helpful... ICX72, a proprietary homeopathic preparation of Capsicum annum and Eucalyptol, otherwise known as Sinus Buster! When used twice daily over two weeks, symptoms were found to be significantly improved when compared to placebo. 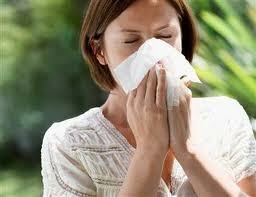 Furthermore, sinus buster alleviates symptoms attributable to non-allergic rhinitis within 52.6 seconds on average. Past studies have shown improvement using Sinus Buster, but this is the first controlled study demonstrating efficacy. Of note, unlike nasal decongestant sprays like Afrin which can result in addiction over time (rhinitis medicamentosa), there does not appear to be any addictive component with this nasal spray. Intranasal Capsicum spray in idiopathic rhinitis: a randomized prospective application regimen trial. Acta Otolaryngol. 2009 Apr;129(4):367-71. Intranasal capsaicin reduces nasal hyperreactivity in idiopathic rhinitis: a double-blind randomized application regimen study. Allergy. 2003 Aug;58(8):754-61. The long-term effects of capsaicin aqueous spray on the nasal mucosa. Clin Exp Allergy. 1998 Nov;28(11):1351-8. Beneficial effects of intranasal applications of capsaicin in patients with vasomotor rhinitis. Eur Arch Otorhinolaryngol. 1991;248(4):191-4. Homeopathic rubbish, it's just the placebo effect.